‘There is one more thing’ with those famous words Apple CEO Tim Cook took paid homage to the late Steve Jobs at their first event in the gorgeous Steve Jobs theatre, sitting atop Apple Park, California. “we have great respect for these words and we don’t use them lightly”, The announcement that followed is Apples biggest leap forward since the original iPhone. iPhone X, pronounced ten, sits alongside iPhone 8 and 8 Plus to complete the company's tenth anniversary iPhone lineup. While each year the iPhone has evolved, the familiar front design has remained relatively unchanged. The new design of iPhone X does away with the traditional top and bottom bezels, removing the home button to make room for a stunning 5.9” OLED Panel which runs edge to edge, following the curves of the design. The screen flows seamlessly from Glass to stainless steel, with a glass back panel making a return from the iPhone 4 of 2010. While we’re pretty accustomed to seeing updates each September, Apple went all out this year improving and reinventing pretty much everything we know and love about iPhone. The glass is the most durable ever in a smartphone, with the whole enclosure microscopically sealed for water and dust resistance. 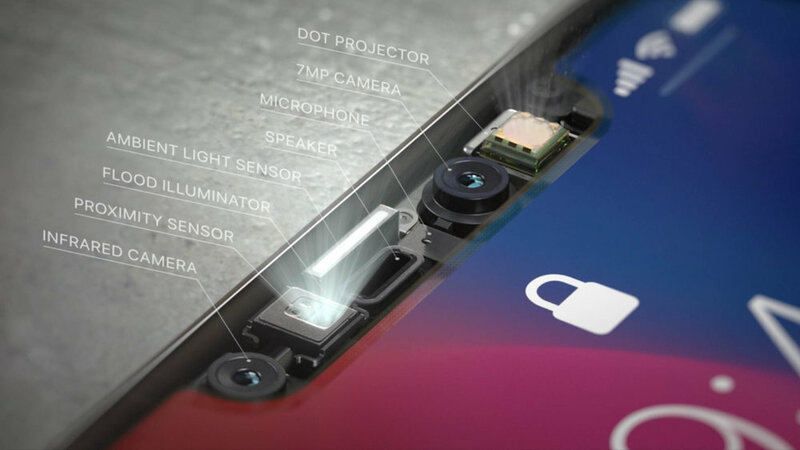 iPhone now supports Wireless charging, and Touch ID has been replaced with new Face ID Technology that enhances security 20 fold, and of course there are massive updates to the camera system as well as the speakers, and internals for a faster more efficient phone. This is the first time apple has used an OLED panel in an iPhone, and for a phone with a history of having the best display on the market, Apple needed to ensure that OLED would not only live up to, but exceed the quality of IPS in terms of colour accuracy and brightness. The brand new ‘Super Retina” display does just that, packing 458ppi in a 2436 x1125 resolution, it supports HDR and has a 1,000,000 to 1 contrast ratio. Additionally It includes true tone to sense colour temperature and brightness changes in the environment in order blend the screen with the world around you, a first for the iPhone. The lack of home button meant that software gestures needed to replace a piece of hardware that has been familiar to over 1 billion iOS users throughout its 10 year history, so the solution needed to be intuitive, fast and effortless. Thankfully Apple got it right. A new system wide swipe up replaces the single click to take you to the home screen and multitasking can be accessed using the same gesture but pausing mid way through your swipe. Control centre has been moved to sit alongside notification centre using a swipe down from the top. And the lock button, renamed ‘side button’, is larger and can be used to access Siri through a press and hold, or Apple Pay using a double tap. Of course the home button housed Touch ID which not only secure, but super fast and trusted by consumers, brands and banks worldwide to protect our sensitive information. Apple’s Face ID is the next generation of biometric security, a huge cut above whats offered by the competition and a major step up from Touch ID. The notch in the top of the screen packs a massive array of sensors and cameras that scan your face in high resolution 3D, day and night, to authenticate your identity and unlock your phone. Important things to note is that Face ID can't be spoofed, Apple worked with leading makeup artists in Hollywood to train the system to spot differences in moulded masks versus a real human face, and additionally as it uses depth sensing technology, photos won't trick the system like they can on other smartphones. Face ID adapts to changes in your face over time, and requires user attention to unlock. It seems like a great solution, however time will tell if it lives up to the hype in real world usage. Both 12MP rear cameras are now optically image stabilised which means sharper images in low light, and smoother video when using both the wide, and portrait lens. A new Image Signal Processor enables Faster Autofocus, better noise reduction and wider dynamic range. Video can now be shot at 60fps in 4k, and the slow motion frame rate has doubled for HD, reaching up to 240fps. The new camera system allowed apple to build upon the Portrait mode which shipped with iPhone 7, introducing an new feature dubbed Portrait Lighting. Using the depth map captured by both sensors alongside machine learning to analyse the lighting on a subjects face, Portrait Lighting changes the way light falls on your subject to capture more flattering and professional looking images. The sensors included in the front camera to enable Face ID mean that the same technique can also be applied to selfies, as well as a new iMessage app called Animoji that lets users create expressive, fun emojis to send to their friends. Additional features include new stereo speakers which are 25% louder and have deeper bass and a brand new A11 Bionic six core chip which couples four high 70% faster efficiency cores for everyday tasks like web browsing with two 25% faster high efficiency cores for gaming and editing. The updated 3 core GPU is 30% faster, and iPhone 8 supports fast charging which gets you to 50% in just 30 minutes, and wireless charging which will work using the open QI standard, however apple will sell their own charging mat using new AirPower technology to power all of your devices at the same time. iPhone X shares many features with it’s little brother - iPhone 8. It’s design also features a gorgeous glass back. And it includes the same upgraded internals, rear camera and wireless charging. However the screen still uses the same IPS technology from previous generations, and Face ID isn’t present here. Despite this the iPhone 8 and 8 Plus still look to be amazing phones and will appeal to a wide range of consumers who don’t need the extra features or sleeker design. iPhone X pre orders begin October 27th, and the device ships November 3rd. Pricing starts at A$1,579 for the 64GB, and A$1,829 for 256GB. iPhone 8 will be A$1,079 for 64GB or $1,329 for 256GB, and iPhone 8 Plus adds $150 to those prices. Pre orders start this Friday with availability the following. Make sure to follow OOMPH! to see the exclusive first look at iPhone X in our hands on review.